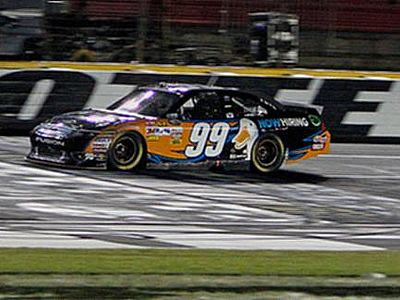 CHARLOTTE, NC – After wining Saturday night’s SPRINT All-Star Race at Charlotte Motor Speedway, Carl Edward’s decided to take a victory slide on the infield grass. Unfortunately, the stunt did not go as planned. After leaving the pavement, the car’s splitter hit something in the grass, possibly a man-hole cover, lifting the car and destroying the front end. "As soon as I turned to the grass...it just dug in the splitter.” Carl continued, “ I didn't expect that," The 99 car’s crew chief, Bob Osborne was not amused and said “the 99 program does not have disposable cars.” But Carl still found it humorous. “Bob has been doing a really good job of keeping the splitter down," Edwards said. "It helps on the racetrack, but it doesn't help on the grass." I guess it is hard to get upsetting after winning a $1.2 million purse. 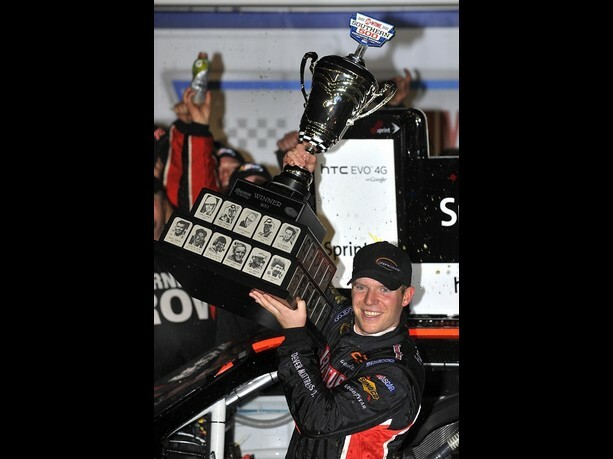 I also assume that Mr. Roush was ok with it – a win is a win. Edwards exited the car with one of his infamous back-flips. Carl Edwards and Kyle Busch looked to have the strongest cars all evening. After a competition 10-minute break, and then a mandatory pit stop for tires, Edwards and Busch were fighting for position on the restart. The Edwards pit crew did a valiant job getting Carl out first. Busch really is one of the best drag-racers out there, but Edwards was able to pull it off and gain the top position with Busch hard on his tail. “I’ve been practicing that little part there,” Edwards said. “There are so many parts of this sport that you have to be good at. Kyle is so good at that. I was really nervous about that last run.” David Reutiman finished third with Tony Stewart and Greg Biffle rounding out the top-5. Edwards said the Ford engines are key. “I feel like Jack and Doug [Yates] have got the engines to a point where we can run with and beat most of the guys on the race track, go down the straightaways,” Edwards said. He also added that Bob Osborne and the crew are doing a great job making “the cars good.” At Burns we’d like to believe that the Burns exhaust technology has something to do with it. 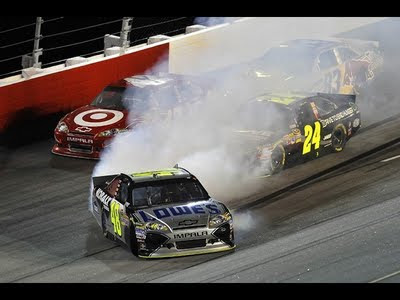 So, with the next two races at Charlotte and Kansas being at 1.5 mi tracks, can Roush Fenway keep it up? Stay tuned to find out. The Coca Cola 600 next weekend is the longest race of the season and will definitely put the Roush equipment to the test. 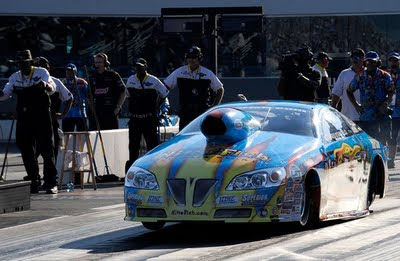 In drag racing news, Burns customer Shane Gray of Gray Motorsports went up against Burns customer Greg Stanfield at the NHRA Summer Nationals in Topeka Kansas in the Pro Stock finals. Before Sunday, Stanfield was 3-0 against Gray but had never gone against each other in a final round. 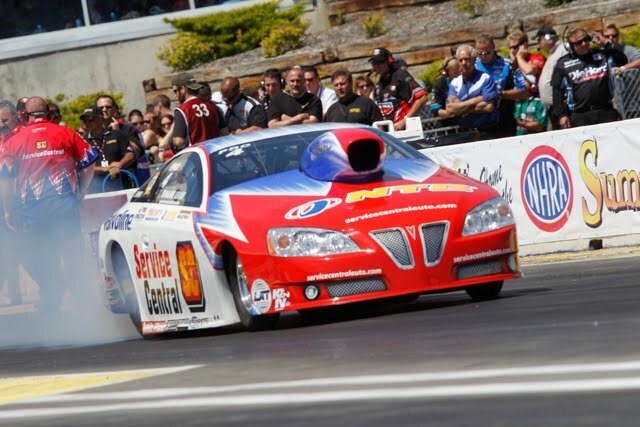 The Nitrofish GXP of Stanfield put up a valiant effort posting a 0.040s light against Shane’s 0.047s. Stanfield kept the starting line advantage to almost half track when the Gray Motorsports power came on beating Stanfield’s et of 6.693s run by a mere 2 feet, posting a 6.679s blast! 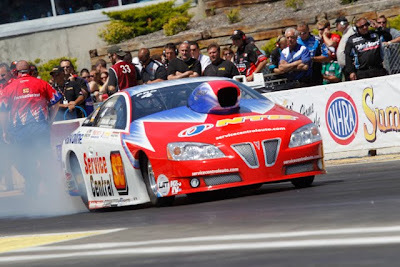 Shane’s top speed was 206.95mph vs 206.29s for Stanfield. This is Shane’s second Pro Stock victory. “We’ve struggled pretty much since the year started, had car issues, engine issues, we just went back to the shop, regrouped, dissected the motor, dissected people, made probably 100 test runs, came here, and the car ran really well,” Gray said. “This win goes to [crew chiefs] Ian [Landies] and Craig [Hankinson] and the entire Service Central team.” What made the victory sweeter for Gray was that he had to eliminate BOTH KB cars in the elimination rounds. Not an easy feat! 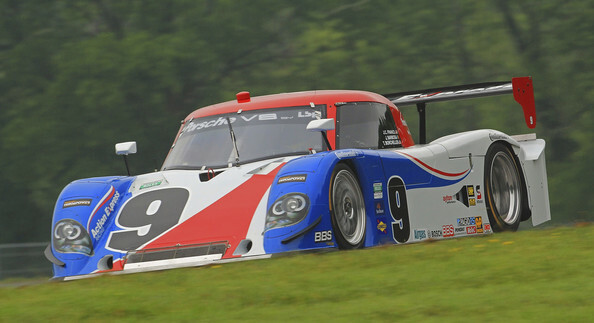 DANVILLE, VA – Though much of the race was run in torrential rain behind the pace car, the GRAND AM Sports Car Series race at Virginia International Raceway (VIR) was an exciting History making event. Bill Lester claimed the victory in the GT-class co-piloting his #88 Autohaus Motorsports Chevrolet Camaro to victory with Jordan Taylor. 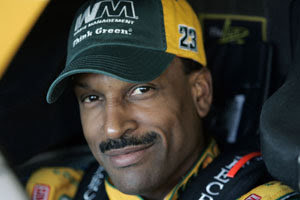 The victory makes Lester the first African-American driver to win a GRAND-AM Rolex event. The 07 Cool-TV Chevrolet Camaro of Schaldach /Gavin placed second followed by the #94 Turner Motorsport BMW M3 of Dalla Lana/Auberlen.The Autohaus Camaro prepared by Pratt and Miller runs Burns merge collectors. Burns Stainless worked closely with the engine supplier, Katech, to develop the winning header design. Lester and Jordan move to 3rd in points following this momentous win. 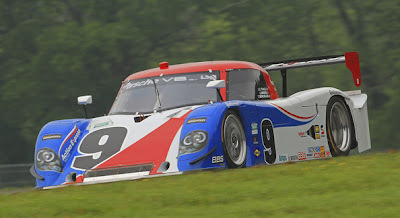 The other exciting race was the Daytona Prototype (DP) class where the Gannassi six-race winning streak was brought to an end by the #9 Action Express Porsche/Riley of Barbosa/France /Borcheller. Barbosa claimed the checkered flag a mere 0.27 seconds ahead of Scott Pruett, who along with co-diver Memo Rojas have won 12 of the last 15 races. 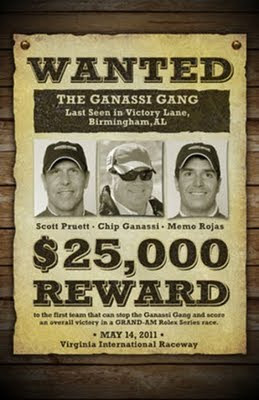 So unbeatable had Team Ganassi become, that GRAND AM posted a $25,000 bounty to the team that could end the Gannassi winning streak. "Chip Ganassi and his entire organization have done an amazing job fashioning one of the most remarkable streaks in the annals of American sports car racing," said GRAND-AM Director of Competition Mark Raffauf. "This reward gives their competition another incentive to step up and beat them to the checkered flag." The winners took home a purse of over $83,000 – better than a poke in the eye I’d say! Joao Barbosa commented after the race, "Everything clicked today. We were able to get the track position at the right time and then I tried to do the best I could at the end. With Scott (Pruett) behind, it's never easy, but I pushed as hard as I could and tried to gain a safe margin just in case. You never know what can come from those guys. It worked out really perfect. Also of note is that the #30 iMoto Racing MazdaSpeed3 driven by Chip Herr and Team owner Glenn Bocchino was equipped with an undercar exhaust built by Burns Stainless incorporating a Burns Ultralight muffler. 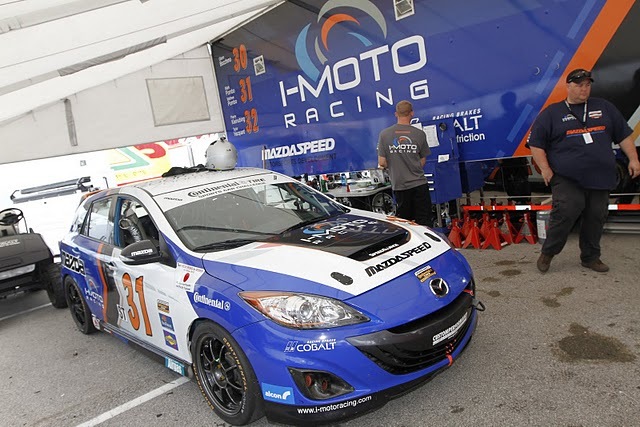 The VIR 250 was a shakedown race for the brand new car. We are expecting great things from the Continental Cup ST class entry in races to come. 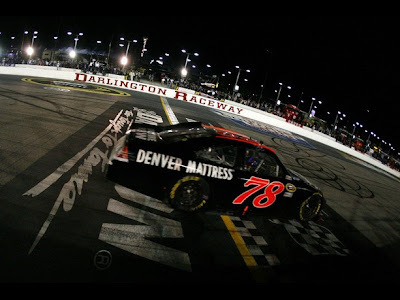 DARLINGTON, SC – It has been three long years since Regan Smith’s victory at Talladega was taken back from him by NASCAR for illegally passing Tony Stewart on the apron. But Smith kept going after it and he finally made victory circle at Darlington. "This is no knock against Talladega at all, but I would trade in a lot of Talladega wins for one win in the Southern 500," said Smith, “This race is so special and so meaningful. We were standing there looking at the names and the faces on the trophy, and you just look at it, and you think, 'my face is going to be there right next to these guys, and it'll be there forever.'" It wasn’t at all clear until they crossed the finish line that Smith was the victor. 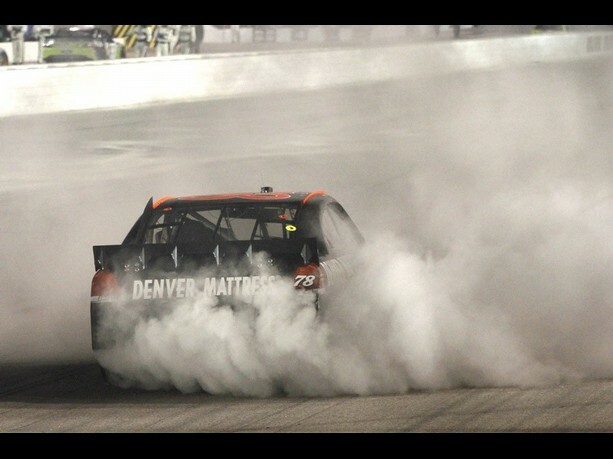 On lap 341, Kasey Kahne acquired the lead until Jeff Burton’s motor grenaded spewing oil all over the track. During the caution, Smith Keslowski and Stewart decided to forego the final pit stop claiming the first three spots on the restart. Smith, with help from Keslowski, managed to hold Kahne off leading into the final laps. It was an exciting few laps with very close racing. Then on lap 363, Harvick came up a tapped Busch on the left rear bumper then came up beside him to pass. With the duo running side-by-side, Clint Boyer came along the inside making it three-wide out of turn 4. It then appeared that Boyer slid-up on Harvick spinning himself into the infield wall. Seconds later, Kyle Busch came up on Harvick, in apparent retribution spinning him and putting the 29-car into the outside wall. The tempers were still flaring between the 18 and 29. Harvick commented over the radio that “…the 18 hooked me.” The reply came not to worry, “we’ll hook the 18 some other time.” Harvick must’ve thought that meant now following Busch onto pit row, then cutting in front and stopping him dead in his tracks. Harvick climbed out of his car and walked back towards Busch. Busch wasn’t going to wait for Kevin to come back and punch him, so with Harvick clear of the car, Busch hit the gas, pushing the 29 car into the pit wall. My choices were limited. 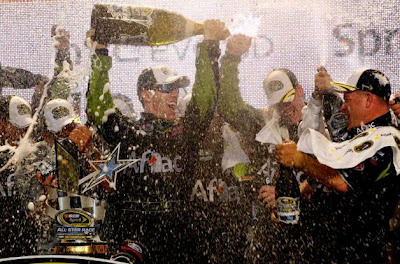 I was either going to get punched in the face and then wait for Harvick to get back in his car, or just drive through his car and push it out of the way so I could get out of there." Luckily no one was hurt. Coincidentally, the 18 and 29 haulers were parked next to one another, and the crews had to be separated following some angry pushing and shoving. Then Kevin Harvick arrived and challenged the Busch crew to a fight. “Y’all are a bunch of %$#8!A NASCAR official said “You’re coming with us to our hauler now!” Harvick followed the official into the “woodshed,” followed soon thereafter by Busch and team owners Joe Gibbs and Richard Childress. After about a 20 minute meeting with Mike Helton behind closed doors, NASCAR spokesman Kerry Tharp stated that “it will be determined Tuesday whether any teams and drivers will be assessed fines and/or penalties. "It was tight racing after the restart there and Harvick was up on the top, a little bit loose, and I gave him room," Busch said. "He kind of came off the wall -- that's a bad angle, obviously -- and then lifted early to let me go into Turn 3 and I thought it was all good. Then he drives into the back of me there, so ... it made my car loose all the way through the exit, and just made a run for those two guys to get back on my inside. "And then obviously Clint wrecked, bouncing off Harvick. It was just uncalled-for; it was unacceptable racing. I know it's the last couple of laps, but I gave him room coming off [Turn] 2 and I didn't get the room." "Obviously we were just racing hard and doing what we had to do at the end. And things happen. That's it," Harvick said. Asked what got discussed with Busch, Joe Gibbs and NASCAR officials in the NASCAR hauler, Harvick grinned and said: "Not much."